Cassidian today successfully performed the maiden flight of the ATLANTE Unmanned Aerial System (UAS). The flight took place at Rozas airfield, in the Castro de Rey municipality of Lugo. 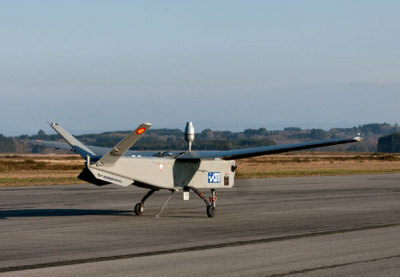 After having determined the Spanish industry’s interest in UAS, the ATLANTE programme was launched by the Spanish Centre for Industrial Technological Development (Centro para el Desarrollo Tecnológico Industrial – CDTI), which acted as an aviation industry programme manager, with the aim of fostering the development of this kind of technology through a project carried out entirely in Spain. The ATLANTE is now the most important industrial and technological initiative in Spain in the UAS sector. Cassidian is participating in the programme as the driving force behind the industrial model, with three high-tech venture capital partners (Indra, GMV and Aries). More than 140 Spanish subcontractors and suppliers are also cooperating in the programme, generating more than 500 skilled jobs. The ATLANTE UAS is equipped with the latest-generation technology (automation, sensors, protection systems, etc.) developed by the Spanish industry, and has been designed according to the standards used for manned aircraft. This gives it unique features in terms of airworthiness and certification that will allow it to operate in civil airspace, unlike current systems that are limited to operations in conflict scenarios (e.g. Afghanistan). This ability, coupled with its operating flexibility – in accordance with the Spanish customer's requirements – make the ATLANTE the first tactical UAS capable of carrying out both civil and military missions, such as urban and rural surveillance, search and rescue, natural disasters, forest fires, monitoring of sporting events, etc., and of operating from prepared runways or being launched from catapults. Cassidian, an EADS company, is a worldwide leader in global security solutions and systems, providing Lead Systems Integration and value-added products and services to civil and military customers around the globe. In 2011, Cassidian – with around 23,000 employees – achieved revenues of € 5.8 billion. EADS is a global leader in aerospace, defence and related services. In 2011, the Group – comprising Airbus, Astrium, Cassidian and Eurocopter – generated revenues of € 49.1 billion and employed a workforce of more than 133,000.